Have you notice a lot Facebook ads that are scammy and look very deceptive? 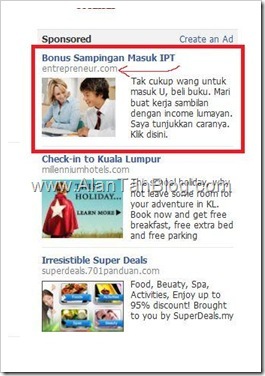 This a trick used by the advertiser to encourage visitor to click the ads. The visitor will think the web site will land on entrepreneur dot com but unfortunely it goes to home based business web site. 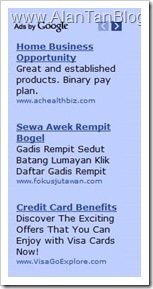 This is a misrepresentation as the visitor is trick to click the ads. This weakness(loophole) in Facebook was exploit by these “clever” advertiser as other online advertising platfoem such as Google AdWords don’t allow the different of Display URL and Landing Page URL. What shown on Display URL must go to Landing Page URL. I hope Facebook will have made commitments to clamp down and eradicate misleading offers and scams. This were example of other ads platform which were scammy and look very deceptive which was found at Google some time ago. This entry was posted on Friday, June 10th, 2011 at 10:30 am	and is filed under Tips. You can follow any responses to this entry through the RSS 2.0 feed. Both comments and pings are currently closed.